This week: Typical stuff. If you know of anyone else who’d like to get our weekly preview via email, the link is here. Private and Public Streets: Ben Parker and others have a petition that the private Rydberg Terrace be converted to a public street. 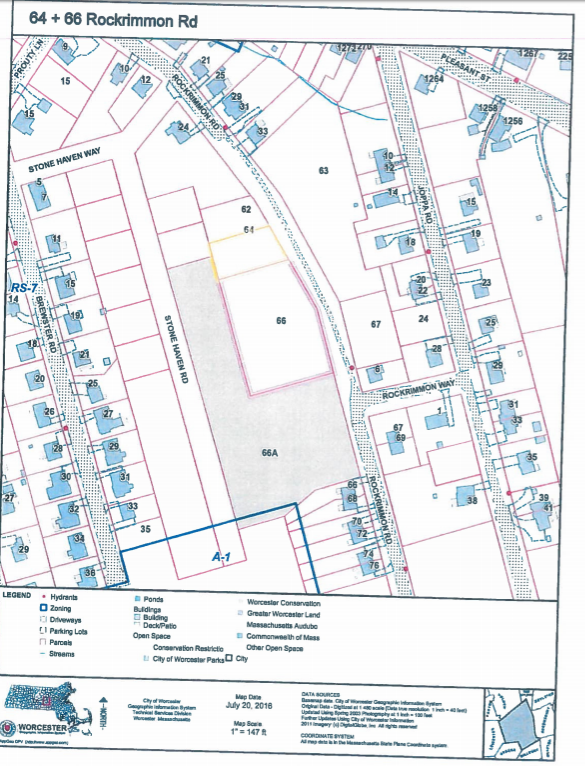 The Planning Board recommends the Council approve pending requests to make the private part of Welcome St., Garrison Ave. from Clark St. to Governors St., and Soheili Circle into public streets. 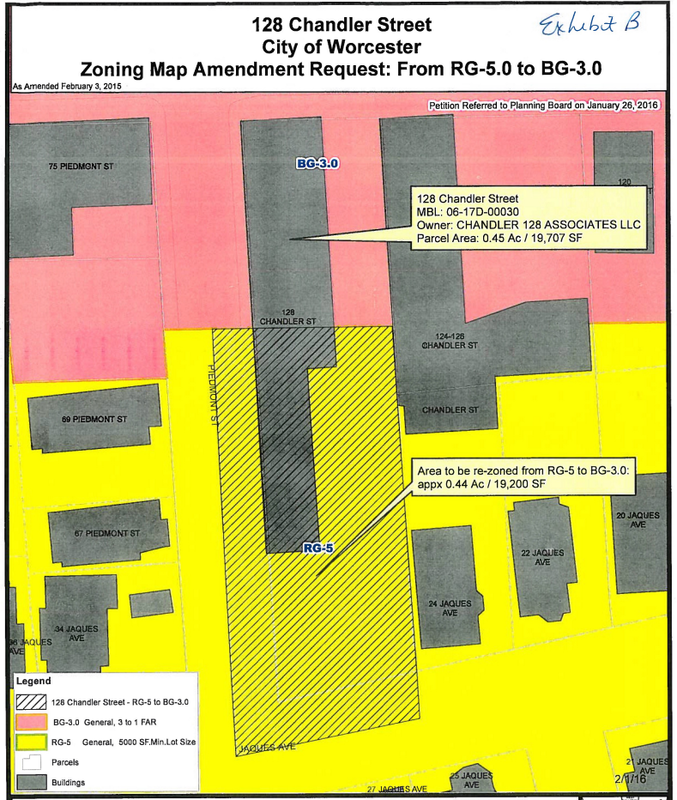 Zoning: Dave Abramo has a request to rezone 11 Nathaniel Ct. (aka 80 Southwest Cutoff) from residential to manufacturing. 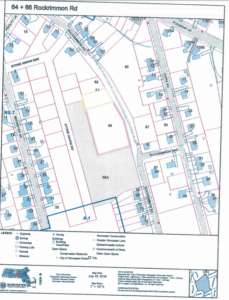 Paul Clancy Way: There’s a proposal to rename Millbury St from McKeon Road to the dead end as “Paul Clancy Way,” after the former City Councilor Paul Clancy. This item is sponsored by a bunch of Councilors: Russell, Petty, Toomey, Lukes, Economou, Mero-Carlson, Rosen, Bergman. Boards, Commissions, Appointments: Izaida Gonzalez and Robyn Kennedy will be apponted to the Human Rights Commission; pending approval, David B. Gately will be made a constable; the Council will vote on whether Womag editor Walter Bird, Jr. should be appointed to the Citizens Advisory Council. Gray Water: The Public Works Committee is asking the City Manager for a report on how Worcester can better use gray water. Get Your Sign Off My Pole: Councilor Rosen has a request that the city crack down on businesses who attach signs to city trees and utility poles. Moving TV Channels: A few years back the city’s public access, government, and educational cable channels were moved from channels 11, 12, and 13 to up in the 190’s. Mayor Petty has an item requesting that Charter, our cable company, move them back. Better Traffic and Parking Hearings: Councilor Lukes has an item asking the Manager to report on better ways for us to conduct citizen petitions on traffic and parking issues. I’m not sure what inspired this. The City’s Legal Fees: Councilor Lukes is asking for a report on the costs and results of all the litigation concerning the city for the past couple years. This seems like a familiar item; I’m not sure what happened the last time it was brought up. Shovel Your Crosswalk: Councilor Rivera has an item asking the city’s website to note that if your sidewalk abuts a crosswalk, then when it’s time to shovel snow, you have to clear a 4-foot-wide path to the crosswalk. Jane Jacobs in the Woo: The first week of May there are a bunch of events in the city inspired by Jane Jacobs’s ideas on how cities work. Councilor Bergman has an item asking the Council to recognize the 100th birthday of Jane Jacobs and all these events. More info here. Five Point Plan: The City Auditor has a report on how the city is doing managing its long-term financial situation. Increasing Water and Sewer Rates: The Public Works Committee is asking the full Council to vote in favor of increasing water and sewer rates for 2018. Water rates would go up 1.9% and sewer rates 2.3%. The city estimates this will cost an extra $13.46 for the typical Worcester home. Traffic Near Worcester State: The Public Works Committee wants the Council to approve the Manager’s plan for a short-term fix for some of the traffic issues near Worcester State University. This would cost less than $100,000 and involve adding some pavement markings and putting up flashing lights at the crosswalks. 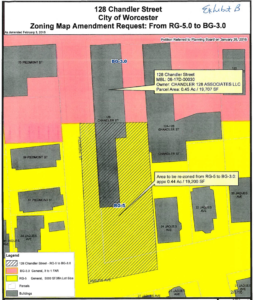 Fixing the Zoning for 128 Chandler: At long last the Council will likely vote to fix the zoning for 128 Chandler St, which has been a mix of commercial and residential. It will now be all commercial. The subcommittee of Teaching, Learning, and Student Supports meets today at 5:30. On the agenda is a review on AP programs (not the scores, if you look at the backup); a discussion of the possible $20-$30,000 per year funding of Worcester Tech membership in SkillsUSA; a report on last year’s summer programs; yet one more report on wifi (citing actual science); a report on “day-to-day PEAK-like instruction” in WPS elementary schools (in response to a request that the PEAK gifted program be re-established); and a discussion of citywide wrestling. The full school committee meets Thursday; you can find the agenda here. After recognitions, there is a report on the Worcester HEARS initiative. There are citizen petitions requesting public hearings on the FY18 budget (required by state law) and on standardized testing. There is a report back on elementary summer programming (18 days, four hours a day, at nine schools); there is a note regarding the decreased funding available this year. The committee is being asked to approve the innovation plan for the Goddard school (the link isn’t to the plan, but to a summary; the full plan isn’t posted). Administration is asking that dates be set for FY18 budget hearings (really, budget sessions, unless they change this to take public comment). Among the recognitions being filed this week is year four of ASBO recognizing the Worcester Public Schools’ budget with its Meritorious Budget Award. Mr. O’Connell wants to request funding for the science AP exams from the state; to submit nominations for awards to MASC; to possibly file items with MASC for its annual Delegate Assembly; and to pass an FBRC petition. Ms. McCullough requests that the No Live Lice policy be reviewed. There’s another round of schools receiving grants for Breakfast in the Classroom from the EoS foundation. The committee is being asked to accept a donation from Scholastic to Woodland Academy, and from Andy’s Attic to South High for marketing. Mayor Petty has filed a plan on PCB cleaning (still no money mentioned). Miss Biancheria wants an inventory of playground equipment. There is also an executive session scheduled: PCB’s, negotiations with the teachers (still), and a grievance from an HVAC worker.